You can find good eats and adult beverages at The Throttle Down Tavern when you’re following the Table Rock Lake/Three Bridges Loop. Better yet, you can put your kickstand down and stay with them at Cruise Inn in Kimberling City. They have a full bar, serving beer, wine and mixed drinks, with friendly bar staff to keep you smiling and you nurse your adult beverage. Appetizers include french fries, mushrooms, and mac & cheese fritters. Food prices are reasonable as are the drinks. Best of all, you’ll enjoy the company they keep at The Throttle Down Tavern. 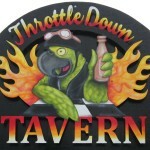 Check out their website, and next time you’re wanting some good company, good food and a cold adult beverage, stop in at The Throttle Down Tavern. Visit their website by clicking this link, to read more about Throttle Down and Cruise Inn.